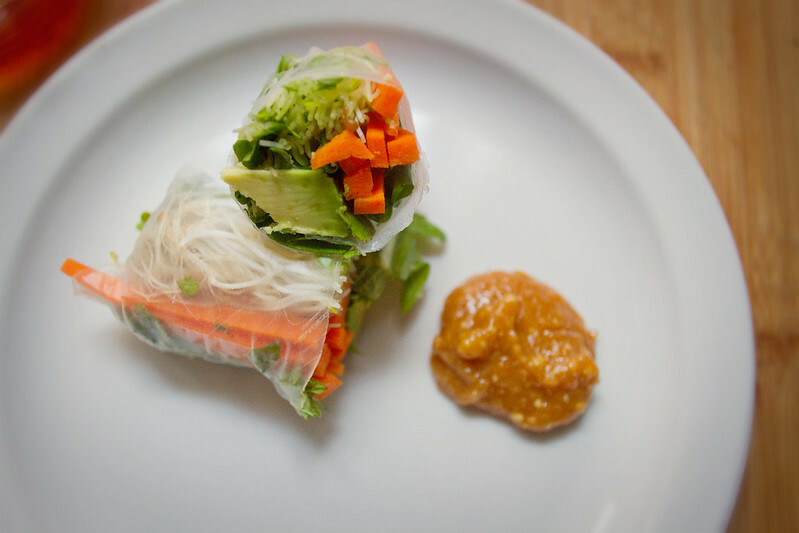 While in Cape Hatteras earlier this summer, S and I made Summer Rolls with my father. This is one of his specialties, and he makes them pretty traditionally, with lettuce and basil, noodles, cucumber, carrots, and shrimp. 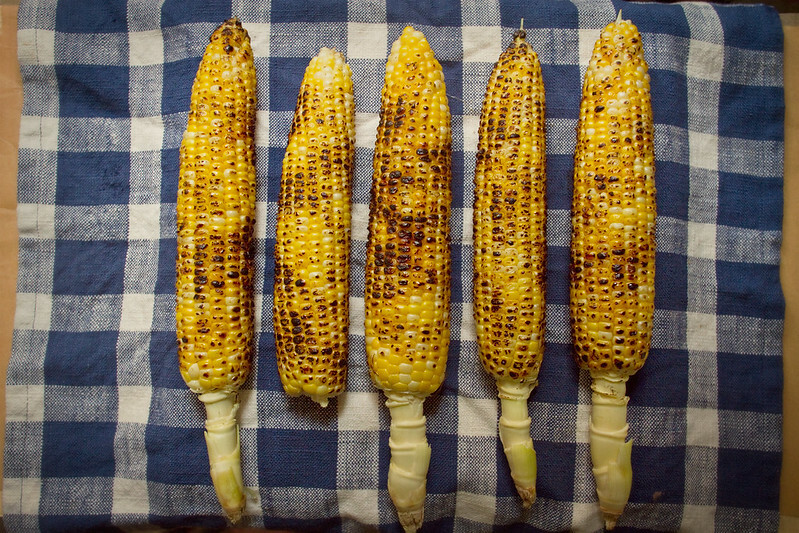 They were delicious, super simple, and reminiscent of dinners at a Cambodian restaurant in Cleveland I've been going out to eat at with my parents for as long as I can remember. My father makes a lot more asian food than I do. From Laab to Bahn Mi to hand rolled sushi, when asked, he proclaims things like "It's easy, you pickle the radishes in your fridge the day before, and the sauce is just caramelized shallots with fish sauce, rice vinegar, hoisin, and chopped thai chilies." Suddenly I understand how my noncooking friends feel when I suggest that it's really very simple to make grasshopper pie with fresh mint and heavy cream dyed green with spinach juice. 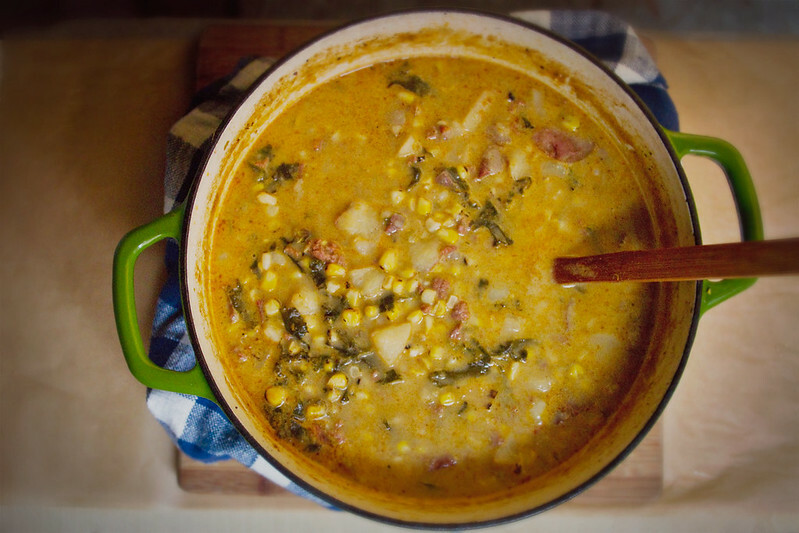 Despite the fact that I undoubtedly got my love of cooking and food adventurousness in part from my father, we have pretty different preferences about what we cook. My father does not cook asian fusion, nor does he have a taste for kale, or strawberries on a pizza. He will probably take issue with the dandelion I suggest you add to this summer roll. It's not authentic, and what's more, it's hippie food. Dandelion, it's a weed! I, however, clearly have no such qualms. I have no problem with taking a traditional dish I enjoy and removing any elements I don't particularly like and adding in ones I prefer. I won't claim this roll is Vietnamese or Cambodian in any way, it is definitely heavily Americanized, it's been vegan-ified, rendered mostly raw, and generally made pretty healthy, but it is also so, so, so delicious. S and I made more the day after I made this batch. The sprouts are reminiscent of the noodles in more authentic rolls, and the slightly spicy dandelion mixes nicely with the cool bits of mint and the velvety avocado, while the carrots provide a lovely crunch. It's all around good. 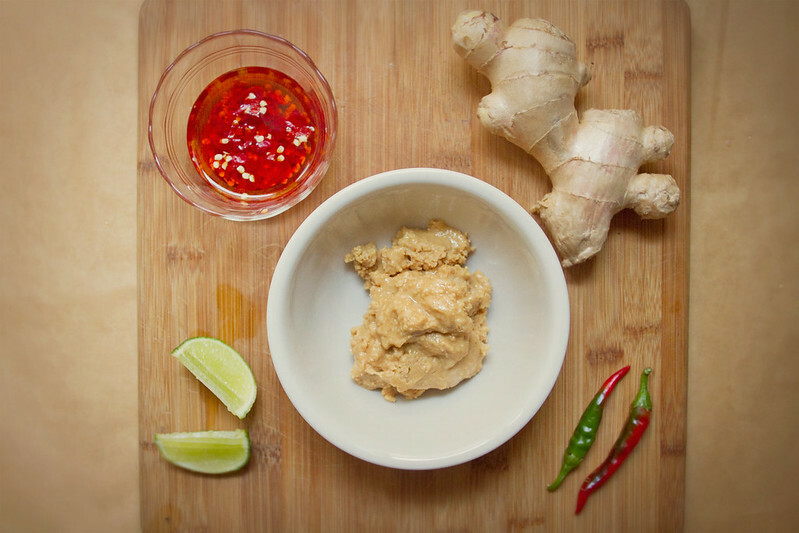 You can use store bought or homemade peanut butter for the sauce, chunky or creamy. I used homemade chunky peanut butter, and it was great. 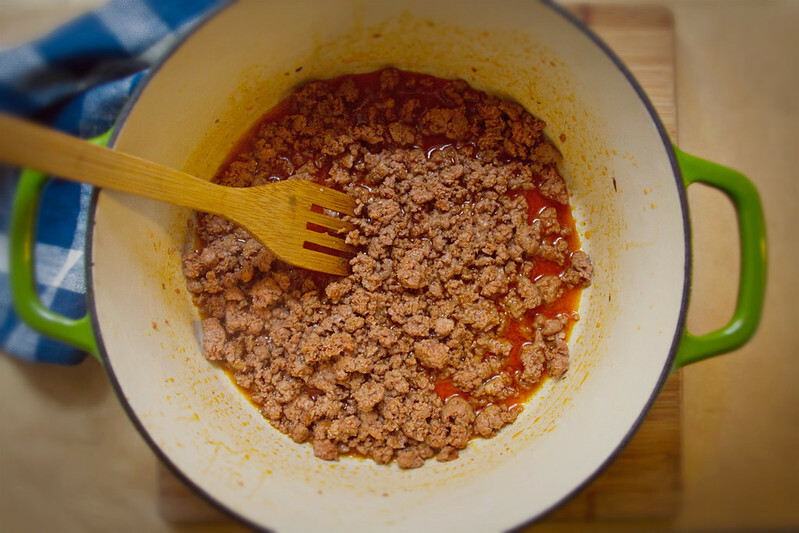 I prefer it spicy so I used two big tablespoons of the chili oil (make sure to scoop in some chili bits too), but you can definitely use just a bit of chili oil if you're sensitive to heat. These rolls would be great as appetizers as a summer dinner party, you could even enlist the first few guests to help with the rolling process. The fillings could definitely be changed around to offer a few options at a party as well, you could add cucumber to some, or matchsticks of marinated beet, or swap out the avocado for marinated slices of tofu, and a small handful of edamame in some could definitely be interesting as well. Feel free to mix these up any way you'd like, I would love to hear about any variations! Combine the sesame and chili oils in small bowl and add the chopped chilies. Let this sit a while, you can even let it sit overnight- though this will make it quite spicy. In a separate small bowl, combine the soy sauce, honey, and ginger, mix well and let sit for 20 minutes or so as well. 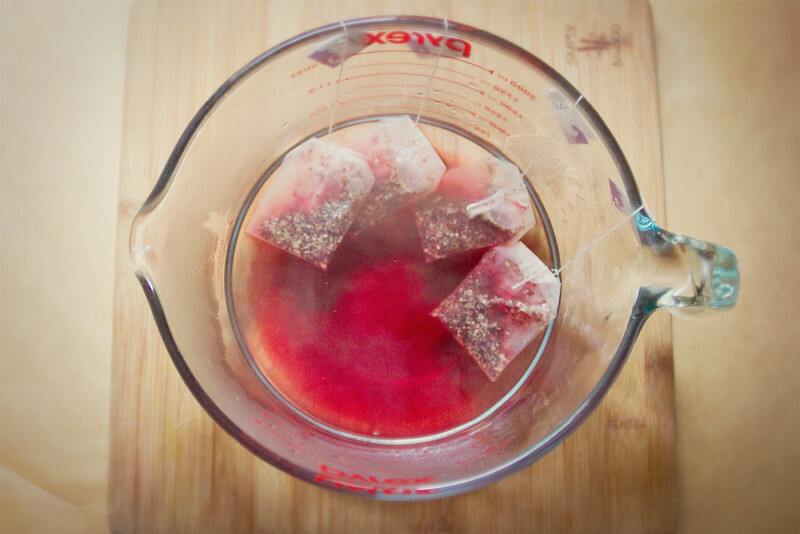 You can do this before cooking, or you can make the rolls while the peppers and ginger infuse their various liquids. 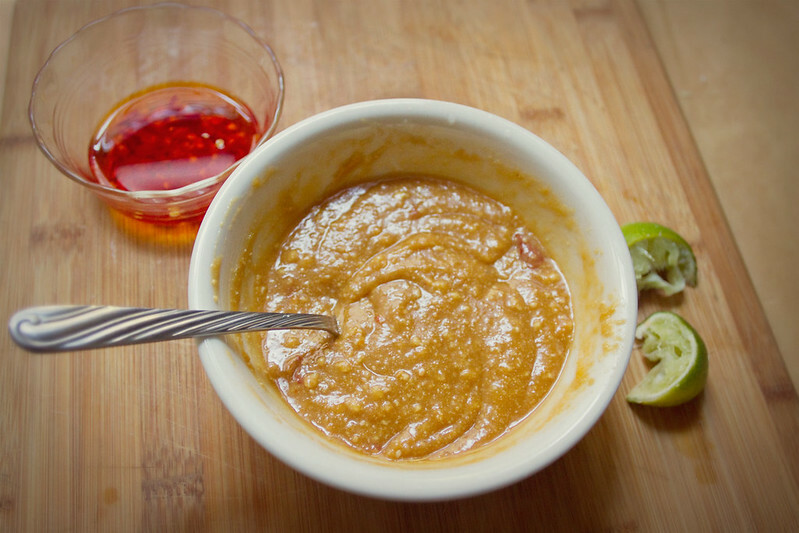 Either way, after 20 minutes or so, add the peanut butter to your soy/honey/ginger mixture, along with 1-2 Tbsp of the chili/oil mixture, and squeeze the juice from the 1/4 lime into the sauce. Mix well. Cut carrots into thin matchsticks. I do this by cutting the carrot into the lengths I want, about 3 inches, then cutting the pieces in to thirds lengthwise, then I slice those thirds into matchsticks. Set the carrots aside for now. Slice the avocado, I cut mine in half, separate the halves, squeeze the side with the pit lightly so it loosens up, then remove it. Remove the skin from the halves, then slice. I cut each of my halves into four slices. 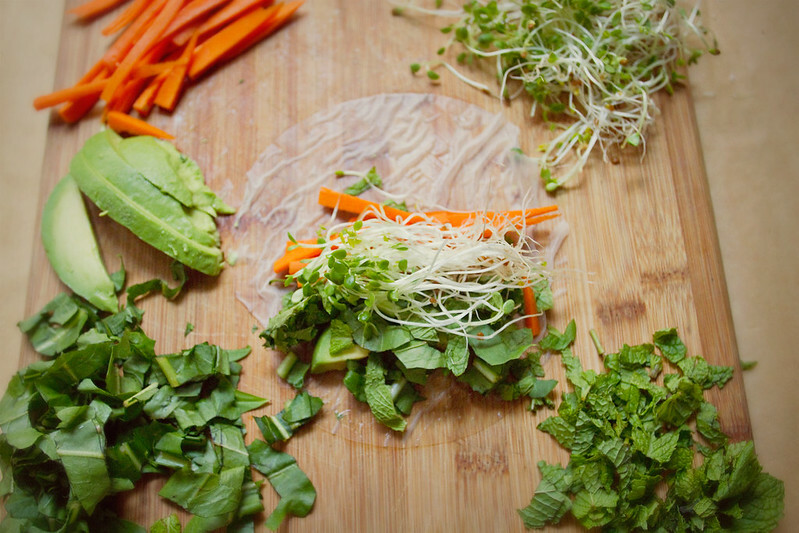 Situate all your fillings so they're easily accessible around an open area of counter for rolling up the spring rolls and the dish of water for wetting the wraps. 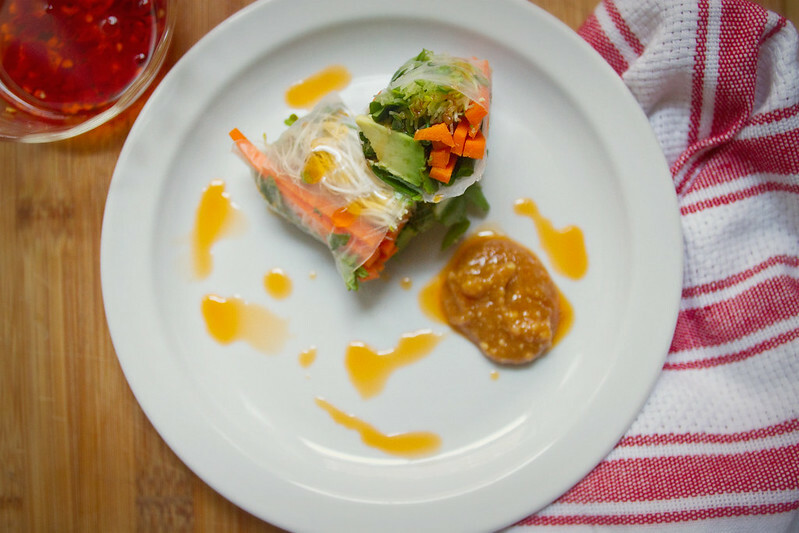 Place one of the spring roll wraps into the dish of water for about 2-4 seconds, or until it begins to feel flexible, but not unmanageably soft. It will soften more once removed, so don't wait until it feels like a finished spring roll skin, it just needs a quick dip. Remove the skin from water and set on your counter- you won't need anything to keep it from sticking, but you do need to work fairly quickly at the next part. 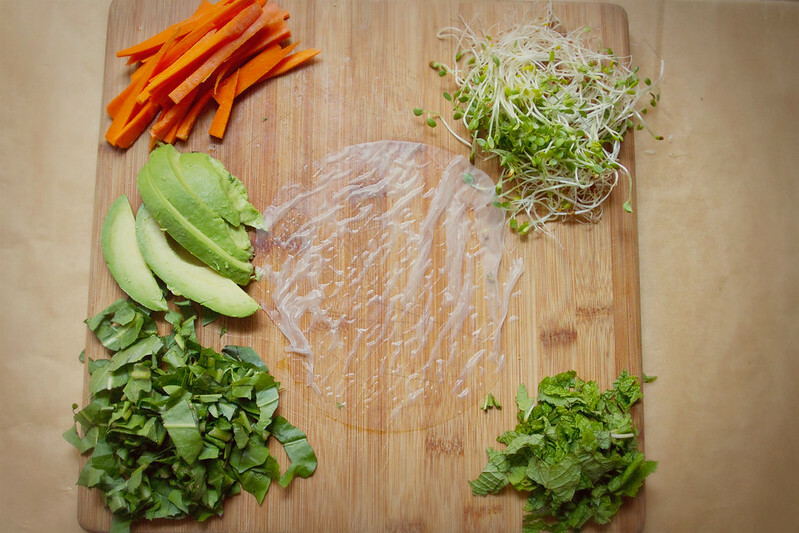 Place a small pile of dandelion greens in the 1/3 of the spring roll closest to you, then a bit of mint, followed by a small pile of sprouts, then arrange a small pile of carrots on top. 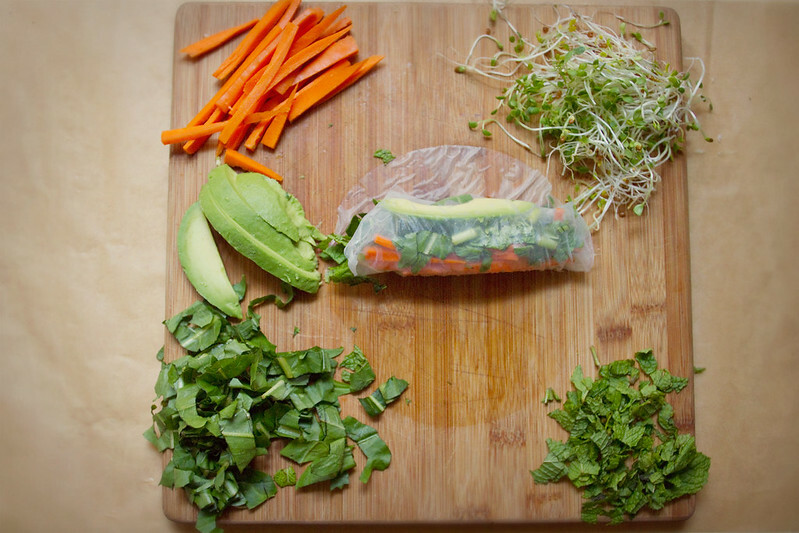 Add an avocado slice last, then roll spring roll. The rolling process is much like a burrito, or a taco bell mexi-melt. 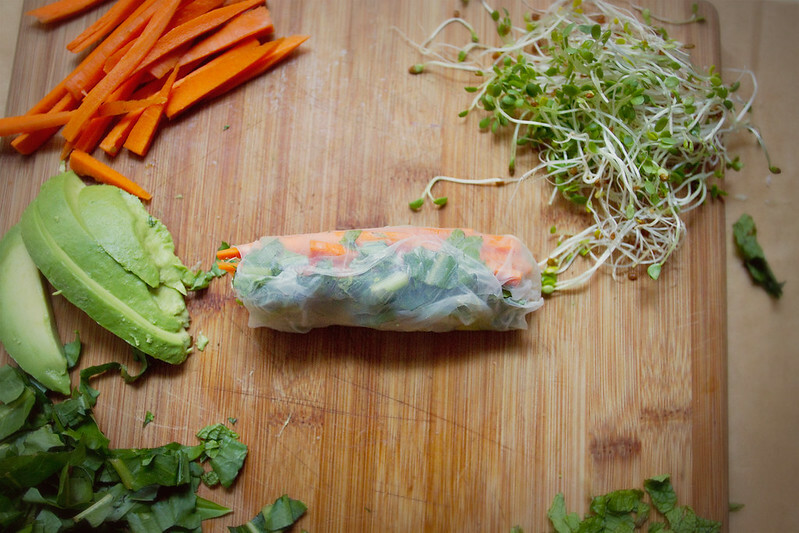 Take the edge of the spring roll wrapper beneath the materials and lift it away from the counter, gather your ingredients together close to the edge then roll it over about one rotation so all your ingredients are inside the wrapper. Take your loose ends and fold them in, like a burrito, then roll it over once more to close. 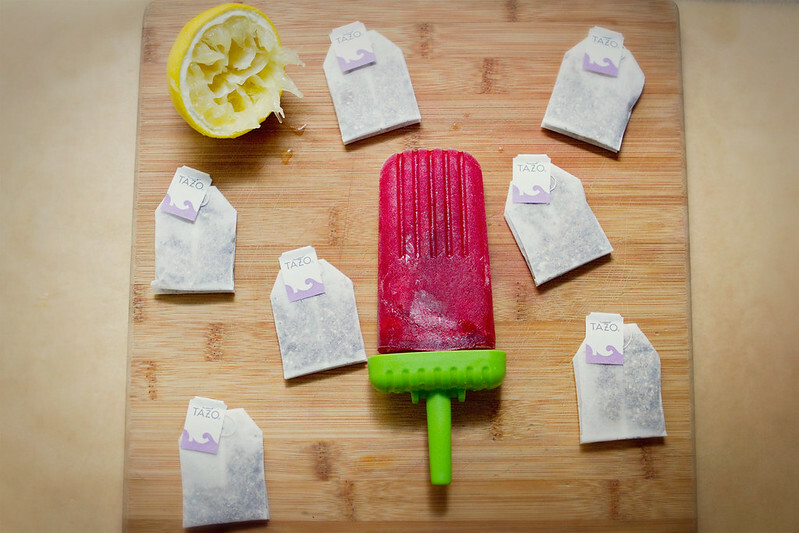 Do not stress if your first ones are funny looking- it takes a try or two to get a feel for the thin wrappers and how many ingredients to put in. You will totally get it, and the spring roll skins are sticky enough that they will stay closed, even if you roll them badly. Place finished rolls on a serving plate, don't let them touch too much, they can end up sticking to each other a bit. Serve soon after preparing, to avoid browning of the avocado. 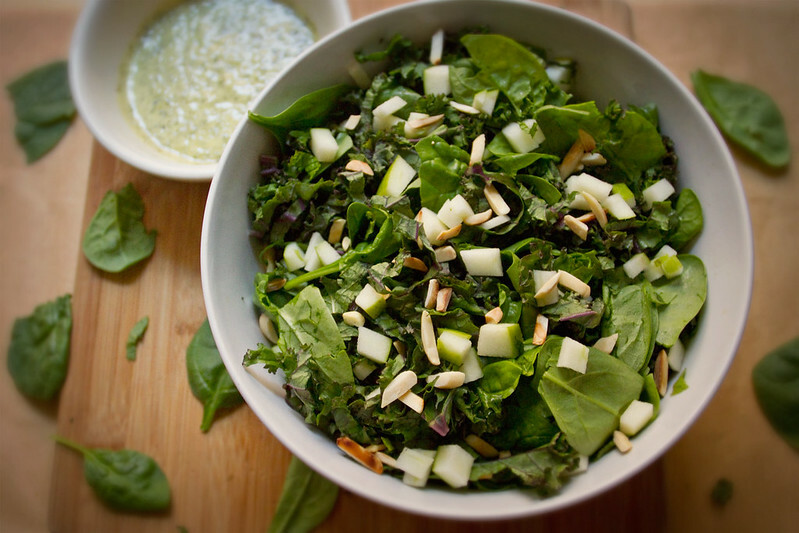 Kale, Spinach, and Apple Salad with Mint-Chive dressing. 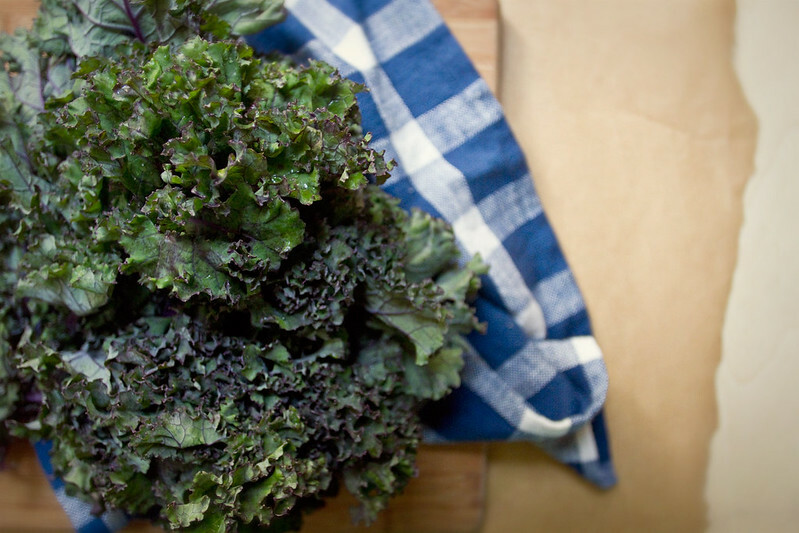 Kale is one of those vegetables people have strong polarized opinions about. 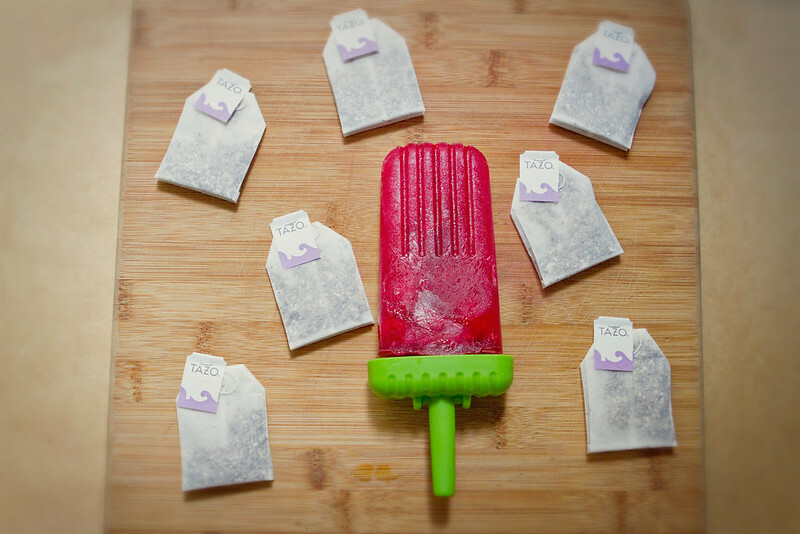 It's undeniably healthy, loaded with vitamins A, C, and K, antioxidants, and even a bit of Calcium, but the flavor is not for everyone. Or is it? I used to think I hated Kale, but not anymore. 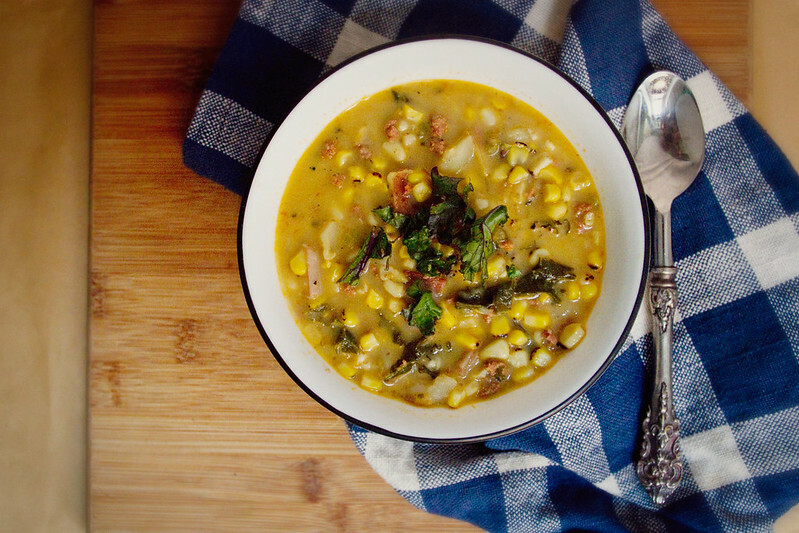 Turns out, kale is one of those foods that tastes great with other flavors. It's fantastic with bacon, balsamic vinegar, and maple. 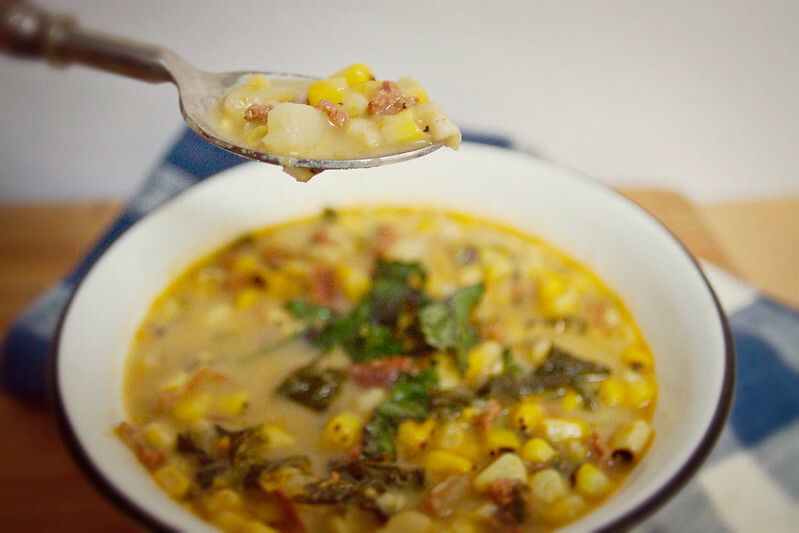 In soup it absorbs all the lovely broth flavors. 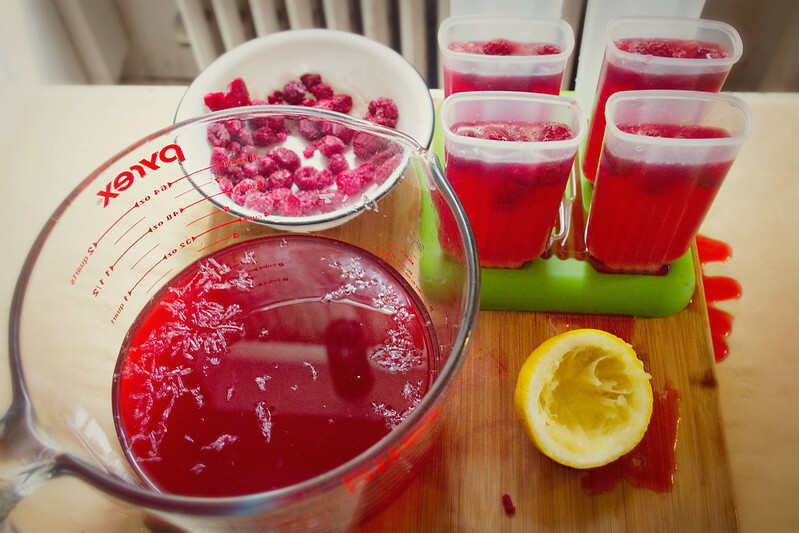 In juice it can hide with ease behind some beet and apple. Baked covered in pepper and paprika kale becomes a lovely chip. 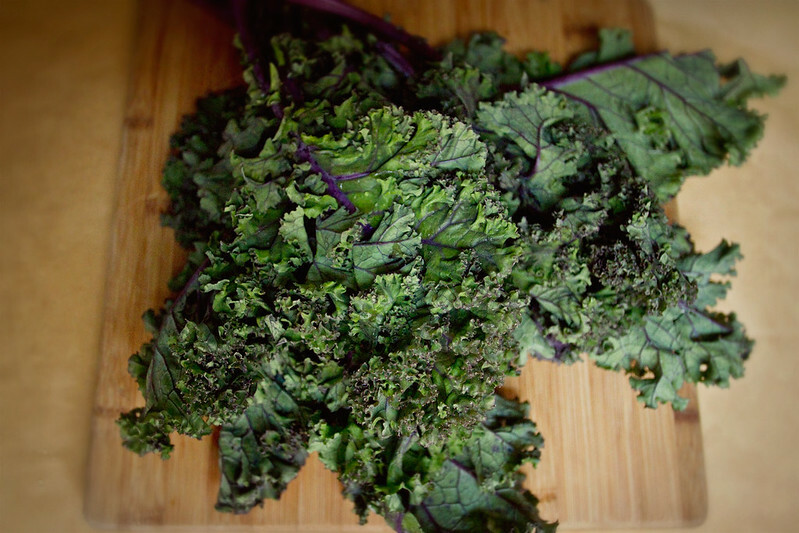 And when thinly sliced, paired with flavorful vegetables, and dressed well, raw kale makes a lovely salad. I've been transformed from a non-kale eater, to an eater of only wilted kale covered in balsamic vinegar, to an eater of any cooked kale, to a juicer of kale, and finally, into someone who will eat kale raw, in a salad. Which is remarkable because aside from not eating raw kale, a few years ago I didn't really even eat salad. That's right, growing up, I thought salad was not for me. The problem was the lettuce. It was boring. Then I discovered arugula, sharp and spicy and lovely, I slathered it in an unseemly amount of balsamic vinegar and discovered it was pretty good. Basically, what I'm saying is covering a vegetable in balsamic vinegar is generally what makes me like it. And yet, this salad contains no vinegar of any sort, and I love it. I've come a long way. The dressing on this salad really takes the cake for me. Or maybe it's the apple bits. 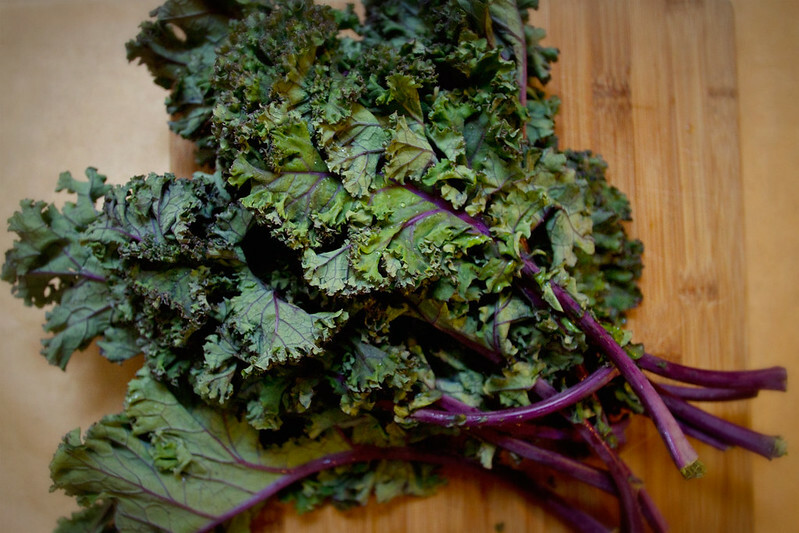 Or the cool sliced mint leaves mingling with the deep, earthy kale. 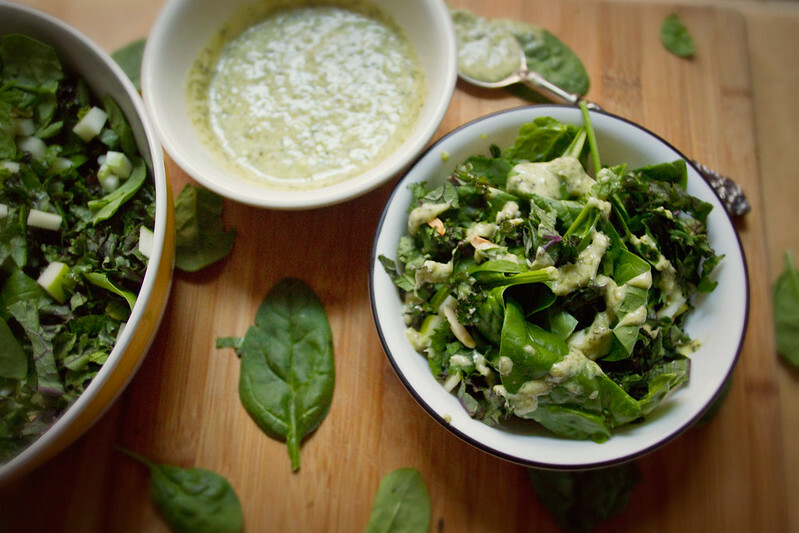 Basically, every element of this salad is heavenly. The chives add a nice sharp element, and the almonds add a bit of crunch. Toast the almonds- add almonds to a dry frying pan and place over medium heat, stirring often to cook almonds evenly. They take a while to start toasting but once they begin to turn golden they'll all toast pretty quickly, so keep an eye on your pan and keep moving the almonds around. 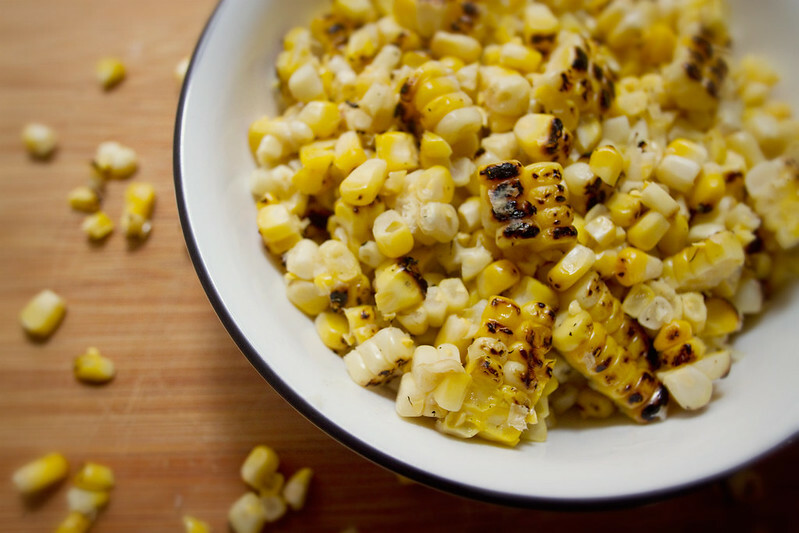 Remove from heat when toasted and set aside. 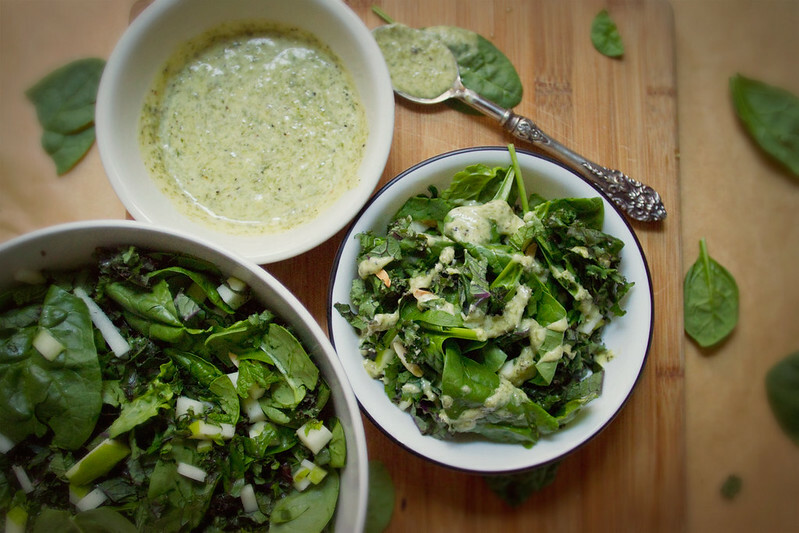 Combine all dressing ingredients in food processor or blender and blend until mint and chive are well chopped and all ingredients are well incorporated. This took about 2 minutes in my food processor. 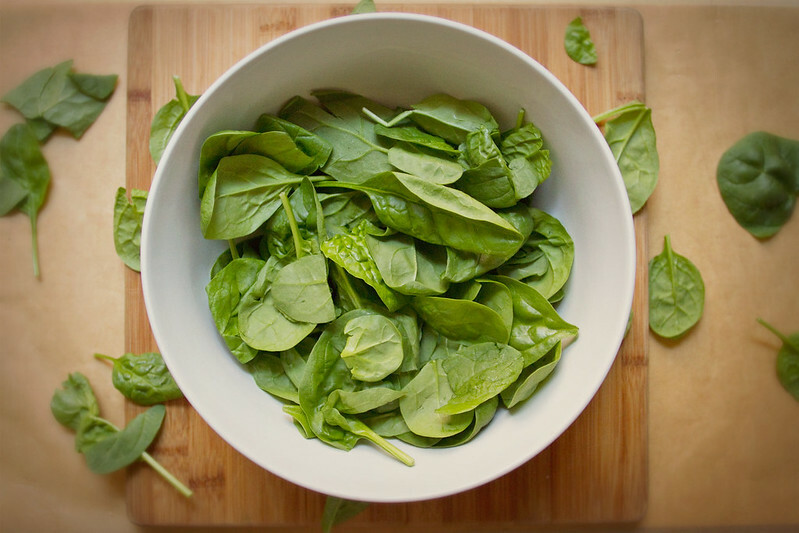 Slice the mint thin and combine with the kale and spinach in a large bowl. Cut the apple into small pieces, I cut mine into matchsticks an then halved the matchsticks, but you could also do 1/4" cubes. 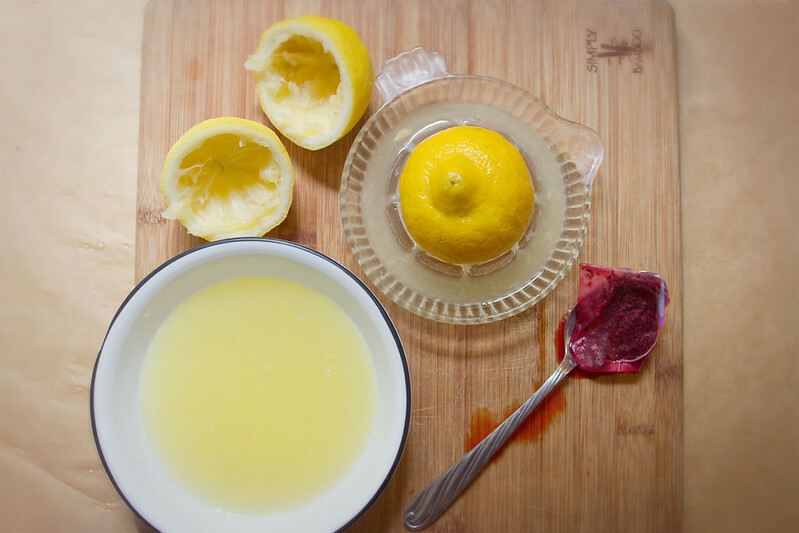 Squeeze the 1/4 lemon over the apple pieces so they will not brown. 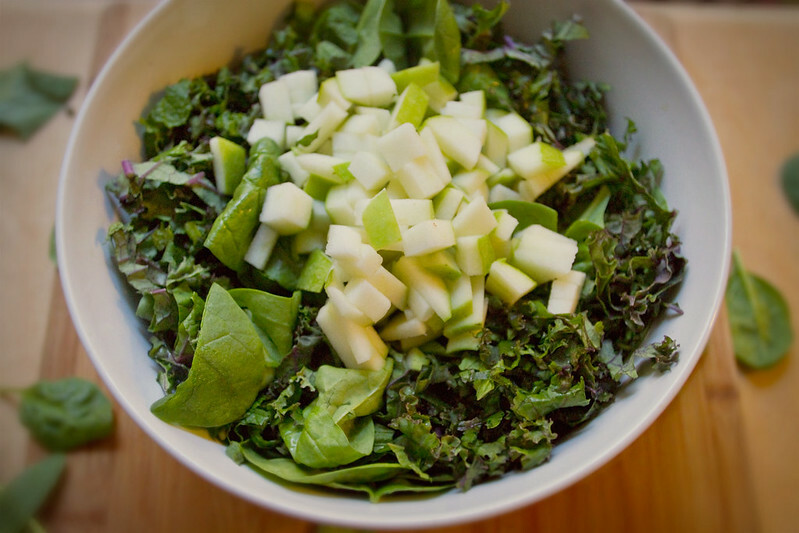 Add the apple to the bowl with the spinach, mint, and kale, and toss to combine. Top with dressing, then almonds. Optional additional toppings could include gorgonzola (I liked this, but S did not), goat cheese, dried cranberries, sliced strawberries, or thinly sliced cucumber. Substitutions: Greek yogurt or sour creme could probably replace the creme fraiche in this recipe. A few years ago S and I discovered a lovely little restaurant in Brooklyn called Traif. They serve an ever changing array of small plates, with a pretty heavy focus on pork. Which is a meat I love. They serve these strawberry cinnamon baby back ribs that make me want to weep with joy.Their crispy berkshire pork tails are the stuff of my food dreams. But I digress, I bring up Traif because aside from all their lovely pork dishes, they also serve a lovely strawberry mozzarella salad we've enjoyed several times. 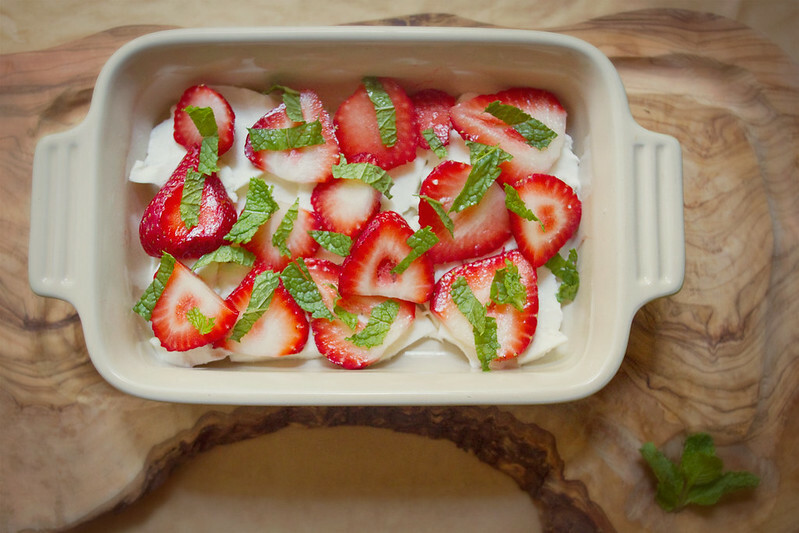 The fresh, creamy mozzarella pairs with strawberry easily (everyone knows strawberries + cream = yum), and the greenness of the mint and the tangy, slightly savory balsamic bring it around to a flavor that is a little sweet, but still firmly grounded in salad, not dessert. For our anniversary this year S cooked up a lovely chicken and white wine rice pilaf casserole, and for an appetizer he recreated the strawberry mozzarella salad from Traif. Neat little slices of mozzarella, each with a perfect strawberry slice on top, a single tiny mint leaf, and a drizzle of fig balsamic vinegar. They were dainty and lovely, a perfect recreation. What I present to you today is not the perfectly neat version of the Traif salad S created, which is lovely, but rather a slightly more casual, rustic take on it, which lends itself well to family style dinners, barbecues, or on it's own as lunch the day you make it for your blog. 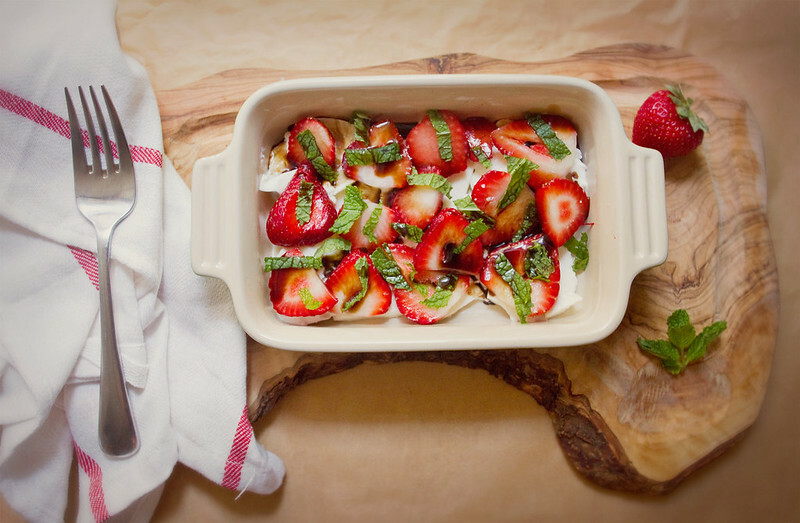 It's incredibly easy, comes together in moments, utilizes seasonal strawberries, and requires no cooking, the perfect summer dish. Cut mozzarella in 1/3 inch thick slices and place on the bottom of serving dish. 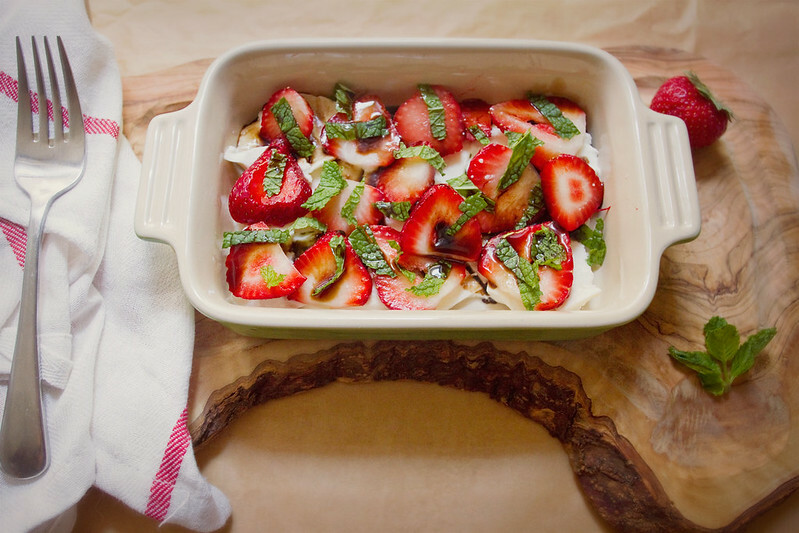 Hull the strawberries and cut lengthwise into thick slices, then cover the mozzarella with the strawberry slices. I use slightly more strawberries than cheese. If you're using small mint leaves, just scatter them over top. 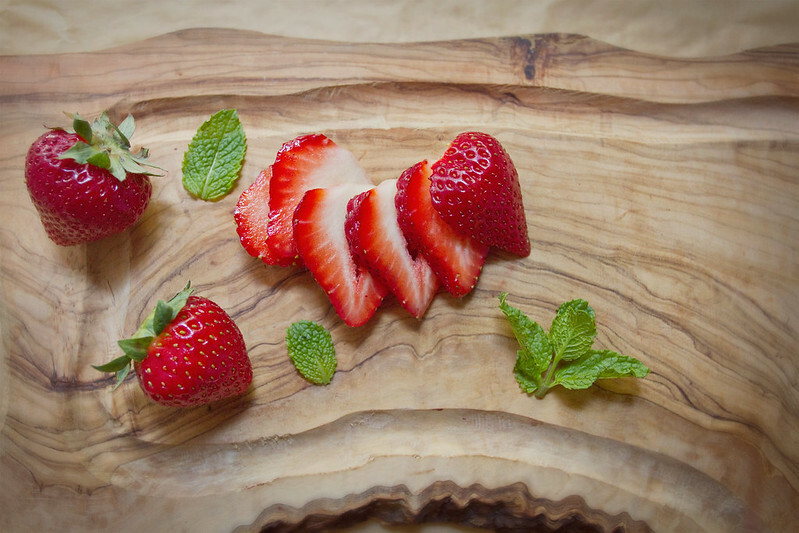 If your mint leaves are larger like the ones my apple mint plant grows, cut them into thin slivers before scattering over the dish of strawberries and mozzarella. Immediately before serving drizzle some balsamic vinegar over the salad. I prefer to use a sweeter, slightly thicker, more aged vinegar. If you want to thicken and sweeten a thin balsamic, see my note at the bottom. Serve as an appetizer or side salad, basically any time you would serve a Caprese Salad. Note: To thicken a thin balsamic, pour 1/2 Cup balsamic into a frying pan with 1 tbsp sugar and cook over medium high, while stirring, allow balsamic to bubble and boil away for a few minutes until it thickens a bit. It will thicken more once cool so don't over do it. 3-4 minutes should do it. 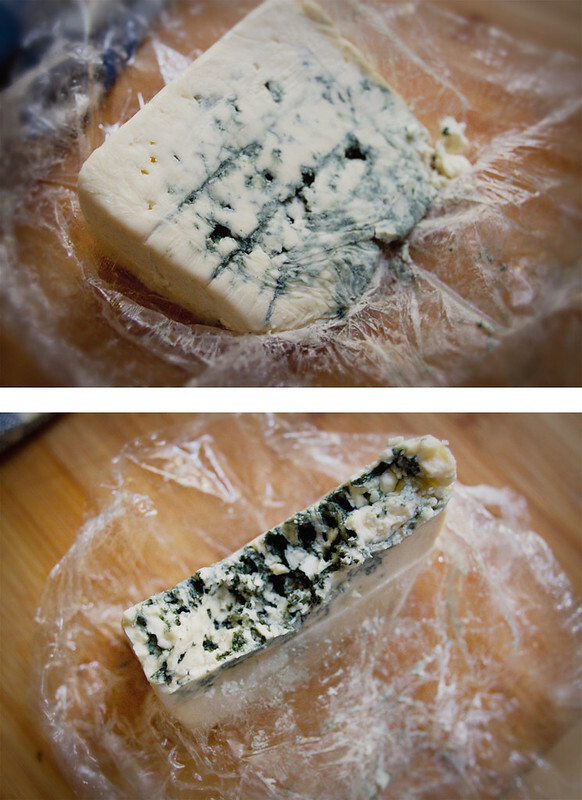 I love blue cheese. 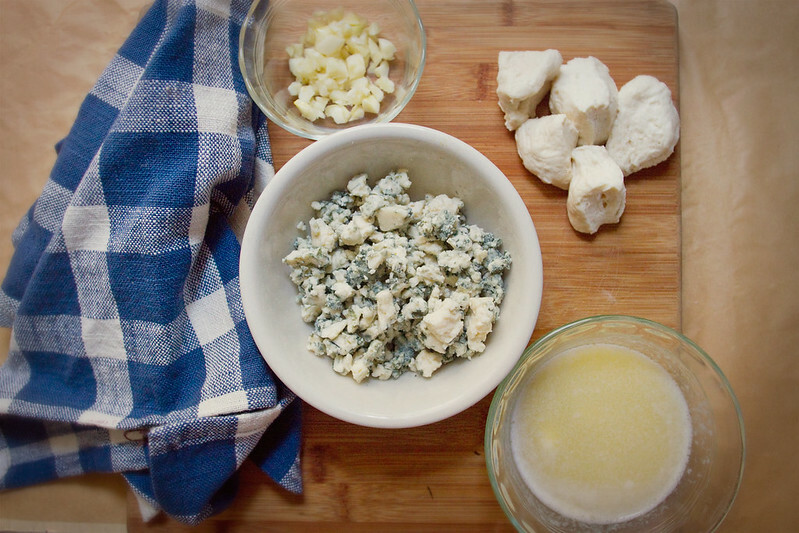 Ok, in reality, you'd be hard pressed to find a cheese I don't love, but blue cheese is certainly one of my favorites. I love it on salads, in dips, with steak, on a cheeseburger with bacon, stuffed inside baked figs, any myriad of ways, really. I'm especially fond of Roth Kase's buttermilk blue. 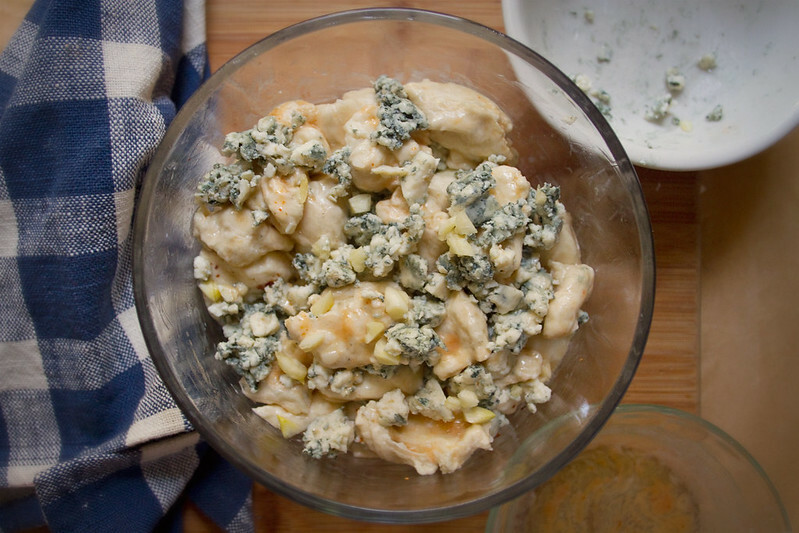 It's domestic, which is something I aim for whenever possible with food, it's loaded with crumbly pockets of blue mold, is not too wet and soggy, and it has a perfect balance of creamy and funky flavors. I mean, look at that gorgeous crumbly mold. 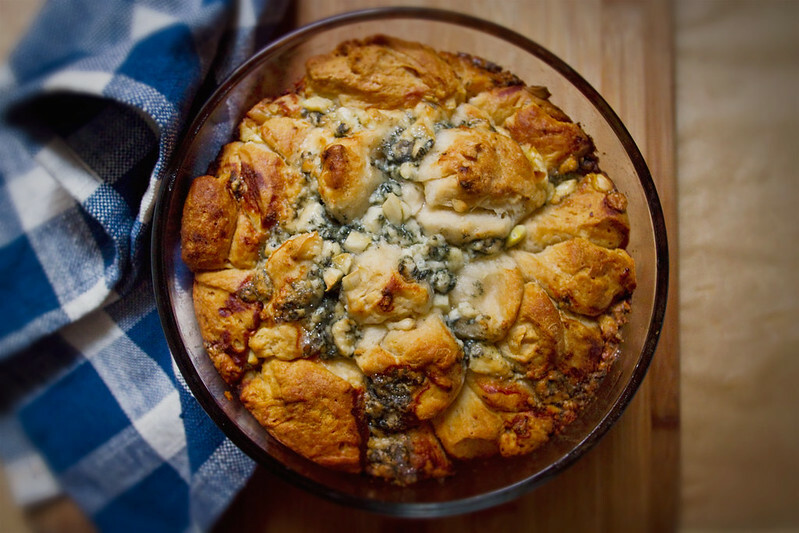 Both the creaminess and the tangy, funky, blue flavor of the cheese is well showcased in this delightfully simple pull apart bread. The garlic and hot sauce are like added bonuses to what was already a winning combination- butter, blue cheese, and bread. 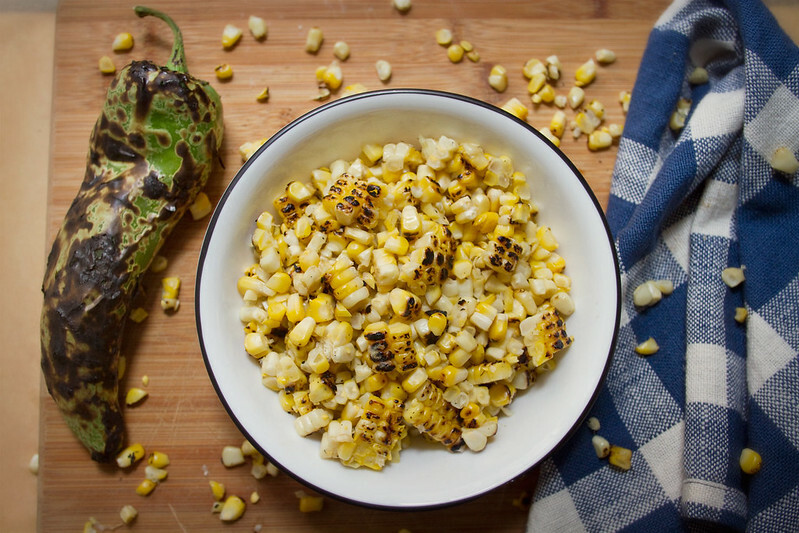 I had a boyfriend in college who introduced me to the concept for this dish when he brought it to a party we were attending, and I ate pretty much all of it. I don't remember the party- whether it was a party with friends or with family, what went on, or even whether it happened in Ohio, New York, or Washington. 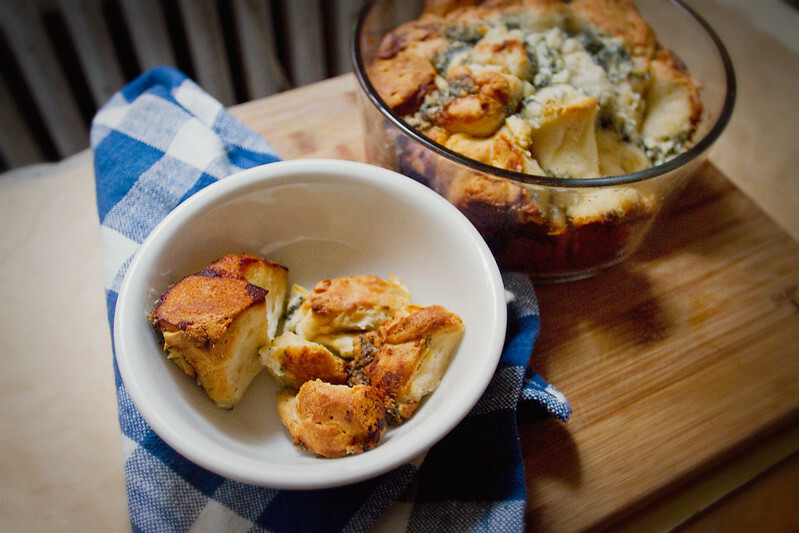 All I remember is the blue cheese pull apart bread. It is that good. His version was spicier and lacked the garlic, but the idea was the same, butter coated biscuits all stuck together with blue cheese and hot sauce. 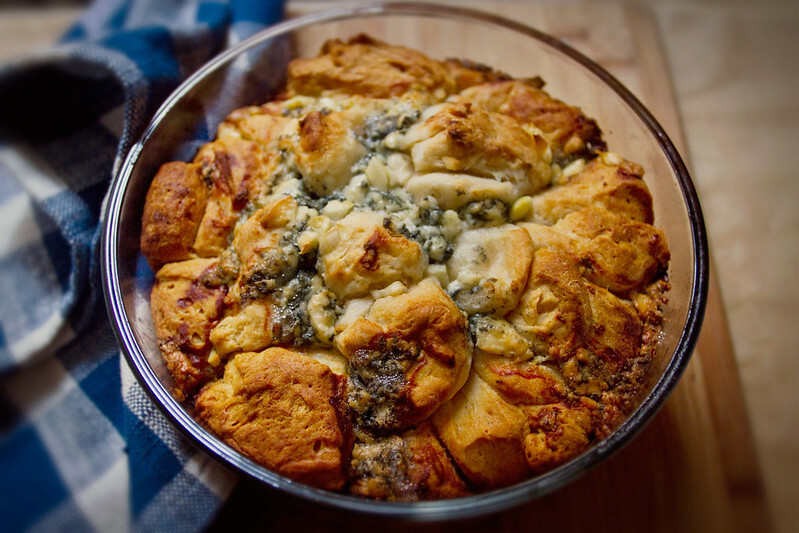 Like a savory monkey bread. I started working on my interpretation of it shortly after college and after many delicious interpretations (you really can't mess this stuff up), I've settled on blue cheese, garlic, hot sauce, and red chili pepper flakes as my favorite toppings. 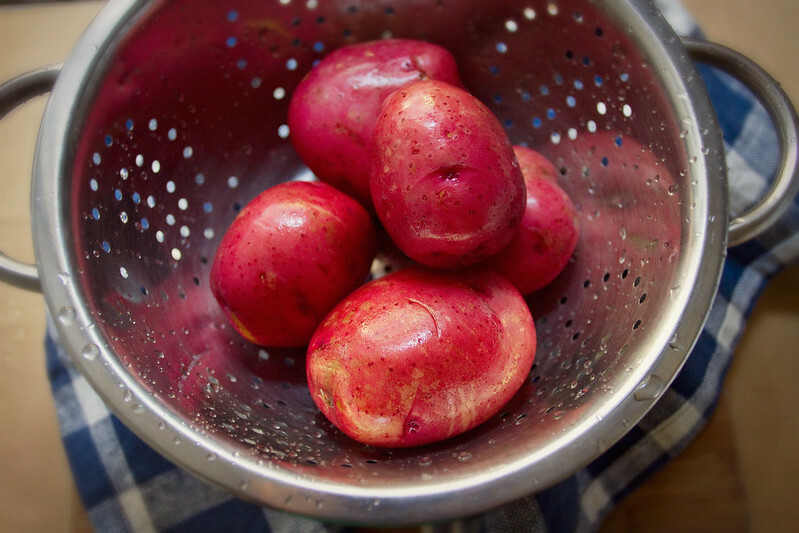 This is a great dish to serve at a dinner party, I like to pull it out of the oven a few minutes after the first guests arrive and put it on the kitchen table for everyone to snack on while we wait for the inevitable latecomers. Plus, putting it on the kitchen table guarantees I can eat half of it while I finish up the rest of the cooking. Coat pan (I used a round anchor hocking dish, you could use a loaf pan, a small bundt pan, a square cake pan, just about any pan will do) with small amount of butter. Melt the rest of the butter in a small dish, add the hot sauce to the melted butter and mix. If using the smaller Pilsbury biscuits, cut each biscuit in half, if using larger rolls of biscuits, cut each biscuit into quarters. Dip the individual pieces into the melted butter/hot sauce then place in pan, after you've covered the bottom of the pan in a single layer of biscuits (about 1/2 the biscuits), add a layer of cheese, minced garlic, and red pepper flakes (using about 1/2 all the toppings). Make second layer of butter dipped biscuit dough, and add the rest of the cheese, garlic, and red pepper flakes. 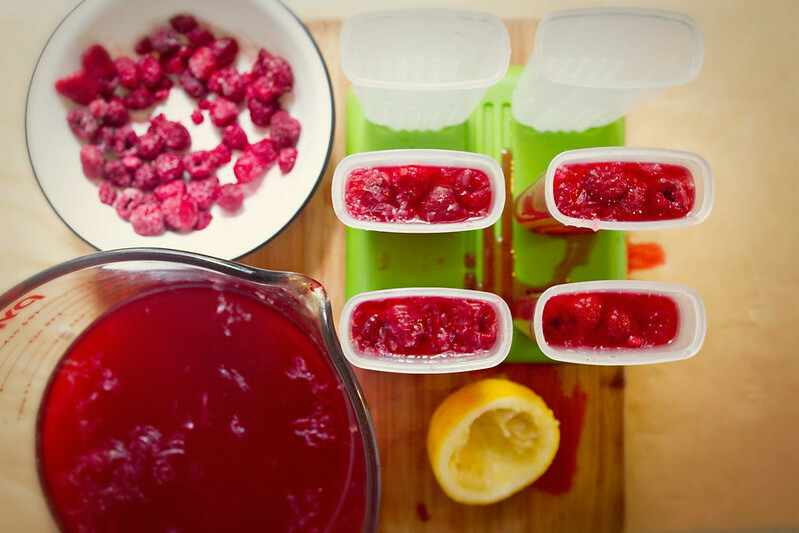 I find this recipe works best if executed in two layers, but more or less will still work. Place dish in oven and bake 30-40 minutes, or until the biscuits take on a pretty dark golden brown hue. You want to wait until it's really a pretty dark gold to guarantee your middle biscuits cook all the way through. Remove from oven and allow to cool about 3 minutes, or the butter will burn you when you pull off a piece. Pieces should easily come apart when pulled with fingers. I serve mine whole and let folks pull it apart with their hands to get pieces.